What type of bikes do you rent? How long can I rent the bike for? What are the hours for bike pick-up and drop-off? Do you provide pick-up service? Do you rent biking gear? Do the bikes have windshields? Is there a mileage fee? Can my friends ride the rental bike? Can I drive with an overseas drivers license? Can I take the bike to Mexico or Canada? Do we need to bring maps? What are some places of interest to visit? Will you take us on a guided tour? What is the best way to cross the desert in the summer? How long is a half day rental? Can I attach my GPS and/or phone charger to the bike? Bikers West is located in Westchester, California, just minutes away from Los Angeles International Airport (LAX). We are convenient to all hotels in the LAX area. We are centrally located for the West Los Angeles and South Bay areas. 2. What types of bikes do you rent? We rent Honda Goldwings, Yamaha 1100cc VStars, Kawasaki 900cc Volcan, and Honda 750cc Shadows & Magnas. See Rental Information for details. Credit card numbers are taken only as a security deposit. Only cash or traveler’s checks are accepted for rental payments. 4. How long can I rent the bike for? Anywhere from a 1/2 day (6 hours) to 12 months. We also rent for DMV license testing that is available for up to 2 hours. 5. What are the hours for bike pick-up and drop-off? We are available 7 days a week. Pick-up and drop-off is scheduled individually to suit your travel plans. 6. Do you provide pick-up service? Yes. We can arrange to pick you up and drop you back off at locations within the LAX area. 7. Are one-way rentals allowed? No. All bikes must be returned to Bikers West headquarters. 8. Do you rent biking gear? No. Gear is included free of charge. If you need a helmet,gloves or saddlebags, they will be provided with the rental. 9. Can I store my luggage with you? Yes. We will store your excess baggage while you enjoy your Bikers West Rental. 10. Do the bikes have windshields? Yes. All Bikers West motorcycles have windshields. 11. Is there a mileage fee? No, you can drive unlimited miles at no extra charge. 12. Is there a fuel charge? It depends. Your rental bike will have a full tank of gas when you arrive. You can return the bike with a full tank of gas or pay a $20 fill-up fee. Yes, the bike is insured in case of accident. You will need your own personal insurance in case of bodily injury. 14. Can I ride with my friends? Yes, Bikers West is happy to arrange group bookings. 15. Can my friends ride the rental bike? Yes, your friends can be passengers, but not drivers. 16. Can I drive with an overseas drivers license? Yes. Also, evidence of a valid license is required for all renters. 17. Can I take the bike to Mexico or Canada? No. Rental bikes must remain in the continental United States. 18. Do we need to bring maps? No, maps will be provided as well as travel guidance based our own first hand experiences. 19. What are some places of interest to visit? We have traveled extensively in the western United States. We talk with each renter to help them find the route that meets their individual interests. 20. Will you take us on a guided tour? Possibly. 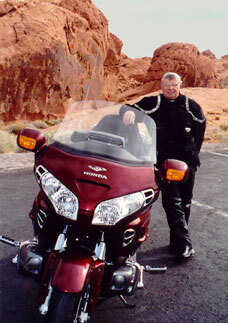 Bikers West can arrange personalized guided tours based on your travel needs. 21. What is the best way to cross the desert in the summer? Leave early in the day. Wear a white or light color, long-sleeved shirt. Carry plenty of drinking water. Drink often. 22. How long is a half day rental? 23. Can I attach my GPS and/or phone charger to the bike? Yes. All the bikes are fitted with power outlets. 24. What if my bike breaks down? In the unlikely event of a breakdown, Bikers West will access the situation via telephone and either cover the cost of repair or bring another bike to your location. Our goal will be to get you moving again as soon as possible. 25. What if I get a flat tire? Bikers West cannot be responsible for road hazards. However, if a tire needs to be replaced, Bikers will cover the cost of the tire and replacement upon return of the bike. © Bikers West 2015. All Rights Reserved.